^ 朱相远. 七大洲由来的考证与反思. 理论周刊·文史. 北京日报. 2012-04-09: 第019版 [2014-02-09]. ^ Sayre, April Pulley. (1999) Africa, Twenty-First Century Books. ISBN 978-0-7613-1367-0. ^ record view - Total population, both sexes combined (thousands). 聯合國数据库. [2013-08-20] （英语）. ^ （英文）Drysdale, Alasdair & Gerald H. Blake. (1985) The Middle East and North Africa, Oxford University Press US. ISBN 978-0-19-503538-4. ^ 7.0 7.1 7.2 7.3 世界七大洲—非洲. 全球黄页 （中文（中国大陆）‎）. ^ （英文）Lewin, Evans. (1924) Africa, Clarendon press. ^ 9.0 9.1 (1998) Merriam-Webster's Geographical Dictionary (Index), Merriam-Webster. pp. 10-11. ISBN 978-0-87779-546-9. ^ 14.0 14.1 （法文） INSEE Réunion. 11.1 - RÉSULTATS ÉCONOMIQUES (PDF). [2008-04-09]. ^ （英文）Hoare, Ben. (2002) The Kingfisher A-Z Encyclopedia, Kingfisher Publications. p. 11. ISBN 978-0-7534-5569-2. 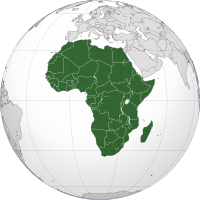 ^ The Spanish 加那利群岛, of which 拉斯帕尔马斯 are 圣克鲁斯-德特内里费 are co-capitals, are often considered part of Northern Africa due to their relative proximity to 摩洛哥 and 西撒哈拉; population and area figures are for 2001. ^ The Spanish 飛地 of 休达 is surrounded on land by Morocco in Northern Africa; population and area figures are for 2001. 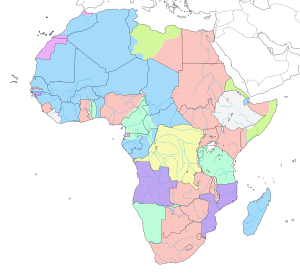 ^ 埃及 is generally considered a 跨大陸國家列表 in Northern Africa (UN region) and Western Asia; population and area figures are for African portion only, west of the 苏伊士运河. ^ The Portuguese 馬德拉 are often considered part of Northern Africa due to their relative proximity to Morocco; population and area figures are for 2001. ^ The Spanish 飛地 of 梅利利亚 is surrounded on land by Morocco in Northern Africa; population and area figures are for 2001. ^ The territory of 西撒哈拉 is claimed by the 撒拉威阿拉伯民主共和國 and 摩洛哥. The 撒拉威阿拉伯民主共和國 is recognized as a sovereign state by the 非洲联盟. 摩洛哥 claims the entirety of the country as its Southern Provinces（英语：Southern Provinces）. Morocco administers 4/5 of the territory while the SADR controls 1/5. Morocco's annexation of this territory has not been recognized internationally. ^ 布隆方丹 is the judicial capital of South Africa, while 開普敦 is its legislative seat, and 比勒陀利亞 is the country's administrative seat. ^ 亚穆苏克罗 is the official capital of 科特迪瓦, while 阿比让 is the De facto seat.